Walter, now a Chief Petty Officer, then moved to the east coast of Ireland and the Kingstown district where he joined the Hind, a yawl of 130 tons. 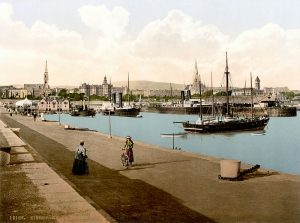 Kingstown is better known today as Dun Laoghaire, the port of Dublin. On the twenty third of June I was promoted to Second Mate and appointed to the sailing cruiser Hind, second in command – Senior Mates were only borne in the steam cruisers – attached to the district ship at Kingstown. I was sorry to be sent to Ireland again, but it was promotion and there was no picking or choosing. This promotion gave me the handsome sum of five shillings per day, a portion of which had to be spent in food to help out the navy rations, and to keep oneself in uniform clothes. On promotion to officer’s rank, a sum of twenty five pounds was granted to obtain new uniform suitable to one’s rank. Nothing further was ever allowed for the upkeep of clothing; that had to be met out of the daily wage and it is easily seen that married men had little surplus at the end of the month. Being granted three weeks leave before taking up my appointment I made my way home and had the pleasure of spending, for the first time, a summer holiday with my friends. Having reached officer’s rank with the possibility of further promotion and serving to the age of fifty five I felt that my future was somewhat secured. During my leave it so happened that I made the acquaintance of a young woman who, after a few brief meetings and partings, became my partner for life. At the expiration of my leave, in the middle of July, I uprooted myself for duty on board the Hind at Kingstown. On hearing of my appointment to the Hind, I was not very thrilled, pleased as I may have been to receive promotion. The commanding officer, a man over fifty who had been slow in promotion, did not bear the name of being a pleasant shipmate or tactful disciplinarian. [*] He had been removed from the command of two vessels on account of so much trouble and punishment with the crew. He was known to his contemporaries as Old Stormy. The story was told that on one occasion when ‘Stormy’ was sitting in his cabin, the vessel being moored in the middle of the dock at Hartlepool, one of the lads who had overstayed his leave arrived down to the dock to come on board. Finding the vessel moored off from the dock wall and wishing to get on board he decided not to wait for the next boat. Having had a drink or two and no objection to a cold dip, he plunged into the dock and swam off. It being a dark evening and the watchman probably down below for the moment, he got on board without the knowledge of anyone. He marched down to the cabin – contrary to all rules – opened the door and reported himself “just come around Flamber Head sir”. The silent indignation of Stormy can be better imagined than described. On reporting myself on board I was greeted by the commander in anything but a welcome, cheerful, make yourself at ease manner. He questioned me in the most uncouth manner as to the vessels I had served in, who I sailed under etc. He was probably wondering if I had been in steam and was possibly lacking in experience in the handling of sail. He soon found that with an apprenticeship on the west of Ireland the latter art had been fully mastered. In a few days we sailed from Kingstown with a list of coast guards for removal with their families. This work on the east coast was easy when compared with the west coast. I very soon discovered this was not to be a happy ship for me. I found the skipper to be an uncouth, gruff, disgruntled, silent, broody individual who never wasted words with anyone. For instance, the King’s harbourmaster at Kingstown sent his boats alongside with an order to take up another berth during the summer months. He only gave the briefest indication that he heard the message as delivered by the coxswain of the boat and totally disregarded the order. The message was sent again and again before he would comply. He seldom addressed a word to me other than the briefest order and persistently treated me with silent contempt. I was his next in command. The next below me was a chief petty officer, a man of a low mind, lacking in self-respect, with no personality, or sense of authority or discipline and always hand in glove with the crew – summed up by the commander in a few words “only fit to look after one man”. The crew of twenty four seamen had a fair sprinkling of Irishmen among them. They usually responded to good discipline but in this case, from a lack of support from the proper quarter, the general trend of things and conduct of the crew was other than what I had been accustomed to. Gambling was not prohibited or discouraged. When in harbour a boat was allowed for the crew to fetch beer on board every evening. This privilege only led to slackness in other respects. This was quite new to me. I had never been in a vessel where beer was obtainable by the crew in this manner. It was quite evident that the Irishmen had the greater influence with the crew; the two leading seamen being ‘sons of the sod’. At dinner time the pot of potatoes was usually placed on the deck and in true Irish custom the men gathered around and partook direct from the pot. With a chief petty officer such as I have described – who was responsible for the cleanliness of the men’s quarters – and the general slack discipline, I was powerless to alter it. These conditions were simply impossible for me and placed me in a rather isolated position. On the day that Kingstown regatta was to take place the Hind happened to be in the harbour. The committee of the Royal Yacht Club had made a request for the use of the vessel by the committee for the starting and regulating of the harbour races and sports. This request had been granted by the captain of the parent ship. During the forenoon the stewards from the yacht club came on board bringing a liberal supply of food, refreshments etc. and without any question took charge of the skipper’s cabin. This being the event of the season the racing committee usually made a day of it. In due course the committee arrived on board and immediately commenced preparations to start the first race for sailing boats. They, with their friends and followers, literally took charge of the vessel, Stormy not being able to find even an entrance to his own room. Silent contempt did not save him on that occasion. He was kicking himself in that he was ignored, the contempt for once being against himself. This was partly his own fault and lack of sociability. In early October the Hind was detached from the Kingstown district and placed under the orders of the senior fisheries officer at Lowestoft for North Sea fishing duties. Sailing from Queenstown we made a good run across channel, the commander making a call at Portland in order to spend a couple of days at his home in Weymouth. Arriving at Harwich – our port of call – orders awaited us to commence the fishing duty by cruising for the protection of the herring fleets fishing out of Lowestoft and Yarmouth, working a week at sea and a week in harbour. This continued with the usual gales, fog and other discomforts of the North Sea at this season of the year until the middle of December. The herring season was now drawing to a close and the date not far distant when the extra cruisers that had been detached for this special work were usually disbursed to their regular districts. We were all hoping and expecting orders to return to Kingstown and anticipating a few days leave but, instead of that, orders were received to proceed north and take on the duty of cruising in company with, and for the protection of, the trawling fleet working on the Dogger Bank a week out and a week in, making Grimsby the headquarters. With the opening of the New Year eighteen hundred and ninety two came hard weather with strong gales, frost and snow and storm canvas. Not the type of weather one would choose for a picnic. We returned to Grimsby for rest, provisions, water etc. What with the weather conditions and Stormy’s orders that the lower deck was to be scrubbed every morning, below decks with the moisture and condensation, everything was wet and saturated. The crew were very soon laid up and on the sick list with severe chest colds, myself included. This kept us in harbour for three weeks resuming our duty as soon as the men were fit. The petty officer and myself had the worst of it, for us there was no fire. The commander had a fire in his cabin. The cooking range was in the men’s quarters. The skipper, poor fellow, was very moody and disgruntled and one afternoon he ordered that the lower mast was to be scrubbed down. That was new to me. I had never seen it done and it annoyed me as it was probably intended to do. The order was passed to the petty officer who mixed the water with so much soda and soap that as it dropped on the varnish and paintwork every drop left its mark. Stormy was not very well pleased but failed to waste any words in making that known. He gave the order and it had been obeyed. With the closing days of March the Hind was relieved and ordered to Devonport for repairs and replenishing stores. On arrival at Devonport the vessel was placed in dockyard hands. Himself had twenty one days leave and the crew fourteen days to each watch. In the meantime I was kept busy refitting and preparing the ship for service. Unfortunately the Petty Officer came on board under the influence and, using threatening language towards me, had to be reported. He was dis-rated and discharged from the ship. That, I think, was partly due on the outcome of slack discipline in general. Stormy prolonged his leave to twenty eight days and when he returned we were due to sail a week later. Wishing to have three weeks leave I made out the usual application giving seven days’ notice. The regulations said ten days – not always enforced – it had to be altered before he would send it on. It was pure obstinacy. Before the expiration of ten days the ship was due to sail. The district ship was at Devonport and, on the seventh day all ready for sea, he went on board for the sailing orders. I requested him to ask the captain if I could commence my leave that day. When he returned on board he uttered not a word but just ignored me. On asking if my request was granted he replied “your leave is approved”. As the ten days’ notice had not expired he did not allow me to land and commence my leave but got underway and sailed for Strangford. On arrival he asked if I wanted to go on leave. My reply was “yes sir” and at once. No time was lost and I was very soon on shore and on my journey home. This shows the type of man under whom I was serving; a big burly six foot of depressing gloom with never a cheery word, a smile or a jest, casting a blight wherever his shadow might fall. At the expiration of my leave I was reluctant to return to such conditions. However there was no alternative and I reported myself on board at Queenstown. In several weeks we were employed in attending to the vessels of the coast guards, carrying out removals between stations. In preparation for the naval manoeuvres, orders were received to proceed to Belfast Lough where the Hind would become the repeating ship for signals, thus playing a small part in the sham attack of the supposed enemy. After the close of the manoeuvres fourteen days leave was granted to each watch of all ships having taken part. This order included the Hind. This special granting of leave was quite unexpected so I decided to be first in the field this time. Immediately, I handed in an application for three weeks leave. My leave was approved and I was soon over the side – leaving himself to look after things in the meantime – with that delightful feeling of being equal with Stormy in regard to the little incident when sailing from Devonport. I boarded the passenger boat from Dublin to Holyhead of a late September morning, with the sky cloudy and threatening and the wind freshening. Before leaving the river I could see that we were in for a rough crossing. By the time the vessel had got clear of Dublin Bay it was blowing a whole gale from the north coast. Among the passengers there were about fifty soldiers who at first were standing about under the whale back deck. One by one they succumbed before the fury of Father Neptune, some finding their way down below, others prostrating themselves on the pile of parcel post baskets stowed in the fore part, all in the grip of seasickness and terrorised by the shrieking gale. Before passing Bailey Head into the open sea there was a well-dressed gentleman and a sergeant in conversation standing just under the break of the whale back fore deck. I overheard the gentleman speculating that we were to have a rough time, that he had crossed the channel numerous times and did not think that he would be inconvenienced very much. While they were still passing a few pleasant remarks within the smooth water of Dublin Bay nothing was likely to happen. Leaving the smooth water of the bay astern, the rough sea of the Irish Channel opened up. With the ship still travelling at a high speed – not having yet been slowed down – when she lunged into a heavy sea, boarding the vessel on the port bow, falling over the whale back onto the main deck in tons, the ship quivering from end to end by the violence of the impact. In a moment, in the twinkling of an eye, the well-groomed gentleman in his silk hat and the six foot sergeant in his polished accruements were on their backs struggling in the water way. Assisted by one of the sailors, the gentleman was soon on his feet again consoling himself with the thought that he had got away with nothing worse than a slight blow to the head and a wet suit. Making myself comfortable in a snug corner, one could only feel sorry for the seasick land-lubbers. One of the passengers, who appeared to be a good sailor, at least not laid out with sea sickness, was heard to remark to one of the sailors “I suppose you often get it worse than this?” “Worse than this” repeated the sailor, an Irishman, “I don’t know what the divil ye want worse”. The crossing took six hours instead of three, with wind and sea enough, rather too much to be comfortable. After the expiration of the special leave, in which the skipper to his great chagrin had no part, the vessel was employed on the old familiar job of removals. The attitude of the commander toward me was still that of silent contempt. He never addressed me by my name only ‘Mister’. I had to remind him that I had a name but that made no difference. Sometimes of an evening, when it was my duty to report at 8pm for orders, he would start talking at me – not conversing – and expect me to stand at his cabin door and listen to something that [had] no interest whatever for me. I resented standing at the cabin door to be talked at just as long as he felt inclined to keep me and very soon decided, after hearing the orders, politely to turn and walk up the ladder. One morning this unhappy officer gave forth a fault finding grunt at me. That caused my pent up anger to break all bounds of naval discipline, opening fire and letting myself go. He heard in plain and unmistakable language all that I thought and felt of his attitude toward me. I cared not for the moment for the consequences. Any words of mine did not appear to make any visible impression but he then knew that he had gone as far as he dare go if he wished to avoid a quarter deck enquiry and that, if it came to reporting me, conclusions might not be altogether in his favour. I was aware that I had laid myself open to a charge of gross insubordination. Finally I challenged him to report me adding “and then look out for yourself”. Had I been reported, I should in all probability have had to face a court martial which might have done me irreparable harm. For certain it would have done himself no good and he was well aware of that. Having relieved my mind I felt a bit more comfortable. As days passed and there was no reference to the matter I became aware that it was not to be a case of reporting to a higher authority. Concluding that I had quite enough of this and that I should never be comfortable or at ease sailing under such conditions I decided to seek for ways and means of getting removed from the Hind. In the autumn the customs authorities became aware of the presence of a Dutch coper cruising off the south coast of Ireland disposing of tobacco etc. – which was quite in order outside of the three miles limit – and suspected that quantities of it were being landed. Orders were received to proceed south to watch the movements of this suspicious craft and to intercept him if found within the three miles limit. A customs officer was billeted on board presumably to see that preventive measures against smuggling were properly carried out. This procedure was quite unusual and seeing that the commander, myself and the petty officer held warrants with power to arrest and detain any person violating the laws relative to smuggling, was resented by Stormy who adopted his usual attitude of silent contempt and simply ignored his presence. The customs official did not feel very happy and I could very well sympathise with him. There was an empty cabin but no bedding which, on hearing that this official was coming, should have been immediately obtained. He was given a cabin cushion, a rug and a couple of blankets on loan. As to his food, he joined with me on the usual navy rations scale to which something more had to be provided from one’s private purse. This was something new to the customs man which he could not quite understand. One day this official wishing to board some of the fishing boats suspected of having dealings with the coper ventured to make his wishes known to the commander. At first he took no notice but just ignored the request. This aroused the anger of the official who in the end threatened to report the matter to his department. That made the skipper think. And with that the boat was lowered and the customs man allowed to carry out his duty and board the fishing boats. Happily for the fishermen no contraband was discovered on board. For six weeks this continued, the Dutchman being careful to keep outside of the three mile limit. I felt sorry for the man and did my best to make him comfortable in his unenviable position. In November I arranged with the mate of the Rose, a sister ship to the Hind – employed on North Sea fishing protection – whose home was at Kingstown, to ask permission to exchange ships. The year was drawing to a close and himself had gone home on three weeks leave leaving me in charge. Early in the New Year eighteen hundred and ninety three a signal was made from the parent ship that my application to exchange with the mate of the Rose had been approved by the admiral commanding. To know that I would very soon step over the side of the Hind where my position had been so impossible and uncomfortable gave me the greatest pleasure and satisfaction. In the middle of January orders were received to proceed to Grimsby for North Sea fishing duty. Stormy had prolonged his stay at home on the sick list. Instead of waiting for his return I was ordered to take the ship to Weymouth. Sailing from Kingstown about the twentieth of January with a fresh north east breeze it soon freshened to a strong gale with a high sea, quite enough for us in running down to the Longships. Considerable damage was done in the carrying away of spars and gear. Calling at Devonport to make good defects gave me the rare opportunity of a weekend at home. In three days we were underway again, calling at Weymouth where the Commander re-joined, thence proceeding on passage to Grimsby. On arrival at Grimsby there was a few days delay awaiting orders when, happily for me, the cutter Rose arrived, thus giving me the golden opportunity of making the exchange with my opposite number without expense to ourselves. I was inclined to show my contempt for such a charming shipmate by going over the side without speaking to him but, on second thoughts, went to his cabin and wished him good bye. He responded with his usual minimum of words. Poor fellow, I suppose he could not help himself and, quite possibly there was a reason behind it, unknown to me. It was a happy relief to me to be clear of such an undisciplined crew and such an impossible Commander, with whom I did not hit it. Whether he was glad to get rid of me I never knew. Nor did I ever see his face again. It must be admitted that he was a hardy, fearless and dauntless seaman. Let the weather conditions be never so bad, it never appeared to disturb his equanimity. He was apt to say, if we put to sea in a gale, it would be moderate before we completed the voyage. Yet on one occasion on nearing a harbour after a hard day, thrashing to windward against a stinging north-easter he remarked “if I had my time to go over again, I would rather go down in a coal mine”. He had joined the cutters when they were under the customs before being transferred to the admiralty and could therefore serve until the age of sixty. He had been late in obtaining promotion and was over fifty-five with no prospect of any better appointment. Eventually when employed on North Sea fishing work he was warned that a captain was coming from the London office to Lowestoft to carry out the annual inspection of the ship. He immediately placed himself on the sick list and on the day of the inspection he would not come on deck to meet the inspecting officer. All the mate could get out of him was “I am sick”. The inspection was not satisfactory. He was ordered to a naval hospital where he was surveyed by the medical board, pronounced unfit for further service and placed on the retired list.